Like so many parents, you have probably tried to teach your child to ride a bicycle and have really given it your best efforts. - Losing the great moments with your child because you can't share riding bicycles together. You wish you knew a fun, easy and safe way to teach your child to ride in about an hour. I understand. The method is unique, simple and completely removes your child's fear of falling and failure. And for you: no more running behind your child's bicycle, no more huffing and puffing, no more holding on to a scared child. With Riding Made Easy and about an hour, your child will be safely and happily riding a two-wheeler. Absolutely guaranteed. 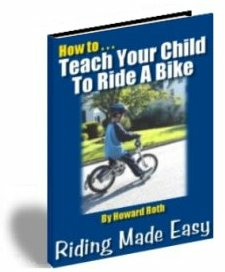 The Riding Made Easy ebook is completely focused on giving you a straightforward, crystal-clear method to get your child riding quickly, safely and without tears. Children actually teach themselves to ride, which is the fastest way for them to learn. And with the games you'll play with them, they'll have a lot of fun doing it and so will you.